One of my first professional experiences with positive self-talk was with a hypnotist through self-hypnosis. I was very upset about a diagnosis that someone in my family had received and I couldn’t calm down. I was crying, anxious and I felt like I was losing my mind. The session promised to help me get rid of my worry and anxiety, and I was willing to do anything. Turns out, it worked. The suggestions in the session helped me see things differently and I instantly felt better about the situation. A sense of calm came over me and I knew that I was going to let go of those tears and worry that I was holding on to. I know that the right techniques can completely change our lives for the better in an instant, which is why I think Marisa Peer is so important. I recently watched a free masterclass with Marisa Peer and I was reminded of hypnotherapy and the impact it can have on your mind. This is because she does an awesome session during the masterclass to help you boost your confidence in the possibility of rejection. Her premise is that you can rewire the brain through Rapid Transformational Hypnotherapy, which is she is an expert at and teaches other people. She says it can treat things like stress and depression. I’ve taken a lot of different Mindvalley courses, and someone in every single tribe I’m a part of on Facebook talks about Marisa Peer at one point or another. People like Marisa Peer on Mindvalley. After watching her Masterclass, I like her too. I already know the power of positive affirmations and hypnotherapy. And, after watching a bunch of her videos and listening to people talk about her, it’s obvious that she has the power to help us change our thoughts and, in turn, change our life. You can find a lot of videos online with Marisa Peer. I like this TED Talk from a few years ago because it’s relatively short and gives you some powerful points to think about. A few of the points I took from the TED Talk. When you can collaborate with your mind and tell it what you want, you will get what you want. Your mind loves what is familiar. Your mind will always move you towards pleasure and away from pain. Link pleasure towards going somewhere different and pain towards staying the same. You have got to tell your mind exactly what you want and link pleasure, not pain, to doing the things that are hard. Powerful, descriptive words work. The pictures you make in your head and the words you say to yourself are all that matter to your brain. There are some teachers out there that can help you think differently and feel better about yourself and your life. Marisa Peer is one of them. 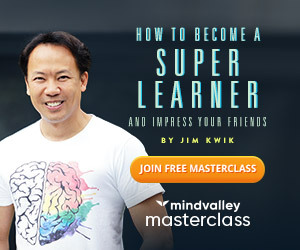 Besides her masterclass I mentioned and her course on Mindvalley, you can find her and learn from her on Twitter, Facebook, her website, and YouTube. You can also check out one of her books on Amazon. Whatever you choose, make sure to take some time to listen to her, learn from her, and try out what she teaches. If you want to live a happier life, this is one of those people who can help.